One of the best drones for new drone plots and older kids (14+ years). Comes with several safety features. Limited range, speed and flying time. Cannot fly in fairly strong winds. 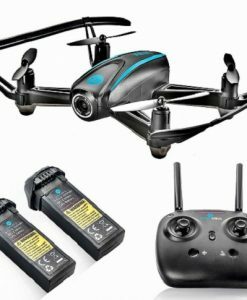 If you are a complete beginner when it comes to flying drones, do not buy a drone worth more than $500. If you are buying a drone for your kid, look for an even cheaper drone. Of course, you will be sacrificing some nifty features like obstacle detection and 4K cameras. But beginner camera drones these days are packed with some surprisingly great features. 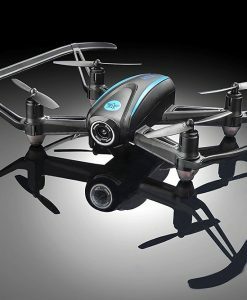 A good example is the Altair Aerial AA108 FPV Camera Drone, which is the focus of our review today. 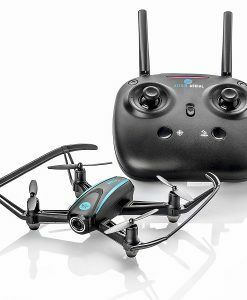 For less than $150, it comes with a 720p camera, live video transmission for FPV viewing, several safety features and easy-fly modes perfect for beginners. Of course, there are better drones with cameras than this but don’t dismiss the Altair Aerial yet. If you are a beginner or you are buying it for your kids (14+ years) to have fun within the backyard, it’s more than enough. Check out this sample footage from the drone and judge for yourself. 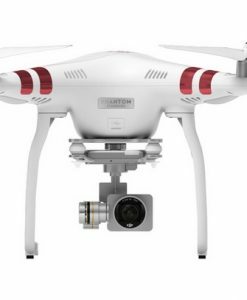 Our biggest reason for recommending this drone is how easy they have made it easy to use. The controls and settings are so intuitive and beginner-friendly. The comprehensive user manual explains all the instructions simply and clearly. And if that’s not enough there are plenty of other resources including videos on their official website. 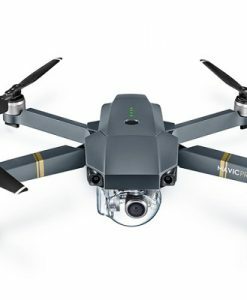 Most people don’t expect a Mavic Pro kind of drone when they spend less than $200. But many buyers were surprised at how well constructed the Amazon Altair Aerial AA is. The drone comes already assembled, so you don’t have to bother with that. All the components are fitted tightly with no bendy or squeaky parts. This is important for beginners who will most likely crash into a tree or the side of the house more than a few times and even more important for younger users. 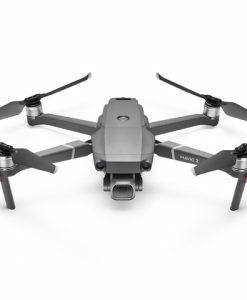 While $130 is not a lot compared to the $1,000+ price tag of premium drones, it’s still money. The strong build ensures you don’t have to keep replacing it every couple of weeks before you learn how to fly it. But Altair knows how vulnerable propellers are. They’ll break at some point regardless of how strong the rest of the drone is. So they include four extra propellers in the package. So at least you won’t have to go back to Amazon after just a few days looking for spare props. The controller is equally well constructed, but it’s not waterproof. So don’t use it when it’s raining or snowing. At 720p, the onboard camera is quite good. You can see the quality of the sample video I embedded at the beginning of this review (make sure you select the highest video quality on YouTube). You cannot angle or rotate the camera like in pricier drones, so you are pretty much stuck in a specific field of view. But with a camera angle of 120 degrees, it’s a fairly large field of view. This means you can take sweeping shots of your home or the lake from above. If you are just introducing yourself or your kids to the world of camera drones, this is an excellent place to start. The best part about the camera is the live video transmission. This allows the first person viewing (FPV) either on your smartphone or using VR goggles (not included). With VR goggles, you can even use the Altair AA as a racing drone. 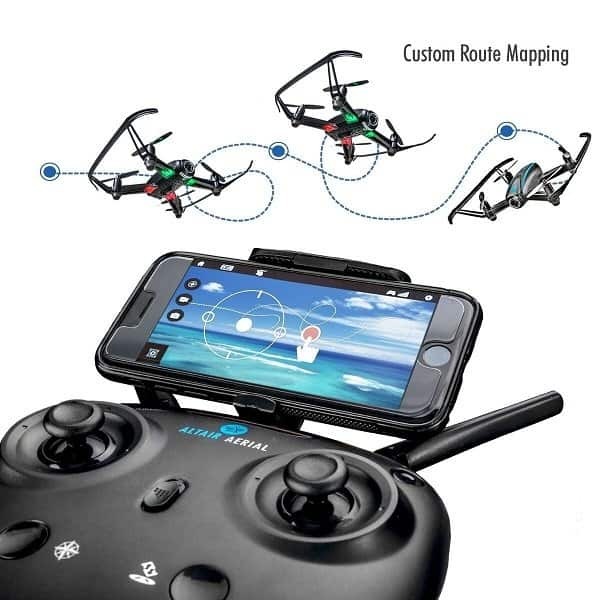 However, if you are shopping specifically for a racing drone, see our other great racing drones with better racing designs and features. Something to note: the video transmission range for FPV is half the controller range. 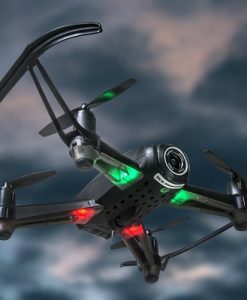 You can control the drone within a 300 feet (100 meters) range but can only use the FPV feature when it’s within 120-150 feet from you (40 to 50 meters). That’s why I recommend this drone for kids and beginners for use inside the house and in the backyard. It’s not something to take with you on your outdoor adventures. A drone is nothing without a good controller. The Altair AA comes with a controller that is beginner-friendly and incredibly easy to use. One of the cool features is a template sheet that you can fit over the top of the controller. It has holes that align with the buttons. The cardboard sheet has directions and labels for every button on the controller, ensuring you can easily fly the drone right from day one. Once you know the basics, you can take the sheet out and keep improving your skills. Using just the two main control sticks, you can control direction and pitch. It’s easier to fly the drone than most people expected. 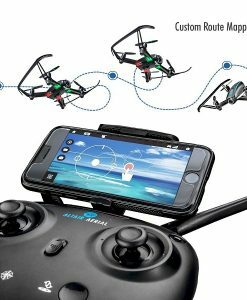 The drone responds quickly to the controller and there are several flying modes to help you fly safely without crashing into things. If you are nervous about flying up and around, there is a button to break the ice. Press the right button on the controller and the drone will fly straight up. Press it again, and the drone gently comes back down. This button also serves as an emergency shutdown. If you are about to crash into something or someone, long press it for a second and it will immediately shut down the motors. The drone will fall to the ground. To maneuver a drone properly, you need to know where it’s facing. The Altair AA has green LED strips to indicate the front and red ones for the rear. But it can be hard for beginners to maintain this orientation especially when the drone is a bit far away. If you don’t know where the drone is facing, it’s easy to press the wrong button and end up in a tree. 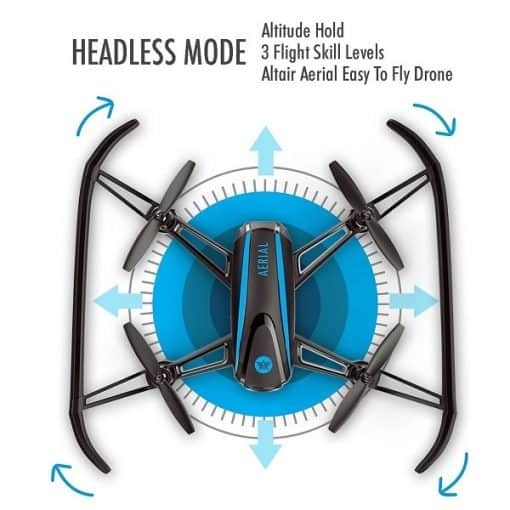 The headless mode button allows you to maneuver the drone towards a preset direction regardless of where it’s facing. If you press the stick forward, the drone will move forward even if it is facing the side. See this short video by Altair explaining this feature and how to activate it. Another great feature for beginners is the custom flights routes. It requires the smartphone app. You simply draw a flight route on the app, and the drone will automatically follow it. Without a gimbal to stabilize the image, it can be hard for beginners to take good videos and images while the drone is flying. A better way to take a good shot is to hover the drone. Use the altitude hold mode to do this using the trim button at the back of the controller. Here is a short video from Altair explaining it. To further ensure that beginners can fly the Altair AA safely and with confidence, there are a couple of safety features. There are two alarms integrated into the controller unit. 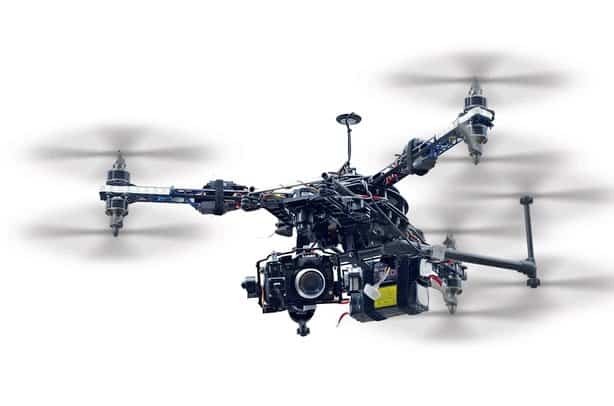 One alarm goes off if the drone goes out of range; that is beyond 300 feet from your position. This is handy for avoiding a potentially dangerous flyaway. The other is a low battery alarm. It gives you the warning to bring the drone back before the battery goes out. The other feature is the emergency landing button. It’s the same one you use for quick takeoff. If you press the button when the drone is in flight, it will immediately land gently on the ground. It’s useful if you start losing control. In more serious emergencies such as when you are almost crashing into something, long press the emergency button for a second and the drone will shut down and drop immediately. 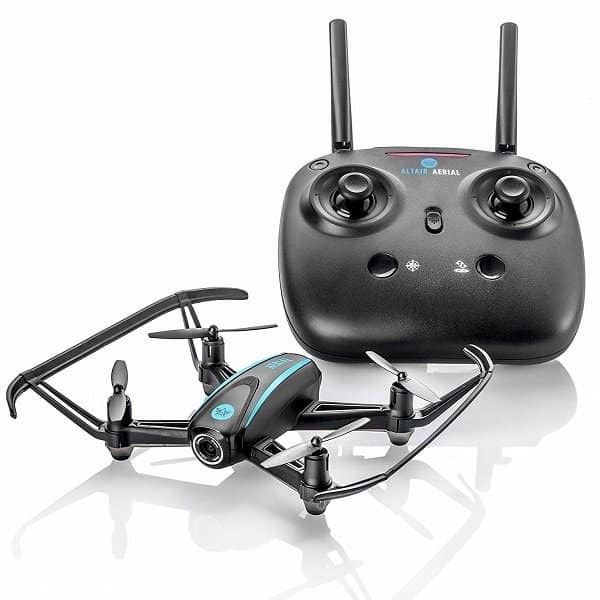 If you are buying this drone for your kid, you can teach them to press the emergency button anytime something is about to go wrong or when they are unable to maneuver the drone. 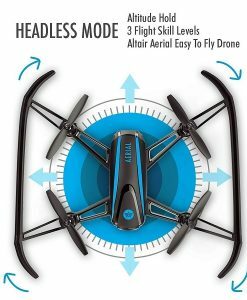 The Altair AA is a beginner drone, but that doesn’t mean that you stow it away as soon as you improve your skills. The drone comes with three skill levels to keep up with your growing expertise. With each level, the drone flies faster. The first level is great for kids and complete beginners. 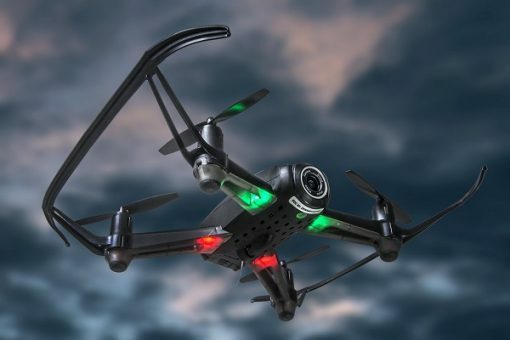 The drone moves at a low speed, making it easy for beginners to control it. The second medium speed level is ideal for those who have learned the basics and wanted a faster challenge. In mode 3, the highest speed level, you have to be an expert at drone flying. You can try some FPV racing or outdoor aerial stunts. After that, you can consider graduating to a proper racing drone or get into another field such as aerial photography or professional drone operations. 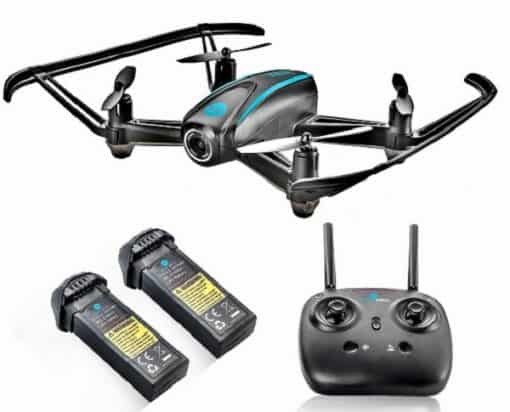 The battery life is not very impressive, but that’s no surprise for such a small and inexpensive drone. It comes with two batteries. Each battery lasts around 10 minutes. You can then change out the battery and get ten more minutes before you need to recharge. There is a USB charger included in the package for recharging the batteries. Refer to the manual for complete charging instructions. 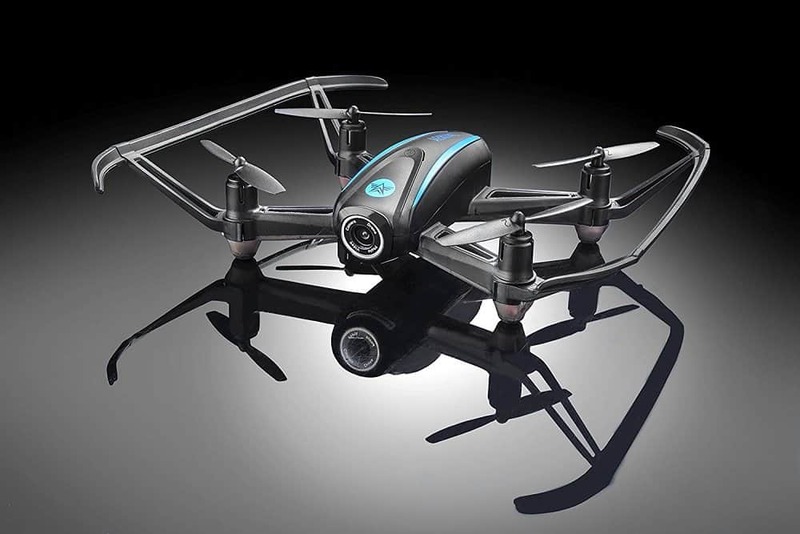 You don’t need a smartphone to use the Altair Aerial AA drone. The controller is enough. But if you want to access more features, I recommend you download the FlyingSee app. The app itself can be used as a controller. But it’s better to use it for FPV viewing. Most phones can fit perfectly on top of the controller. So you just need to connect your phone to the controller and fire up the app. See the manual for instructions on how to do this. 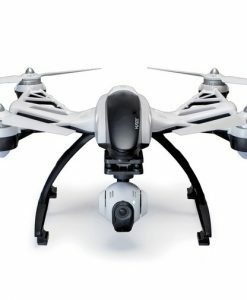 The app will immediately show you a live feed from the drone camera. The live video is smooth and does not lag at all. Note that the video transmission range is 120 to 150 feet. Using the app, you can take still pictures and save them in your phone’s gallery. You can also record a video, but you need to first insert an SD card into the drone memory card slot. If you try to record without a memory card in the drone, it will show an error. 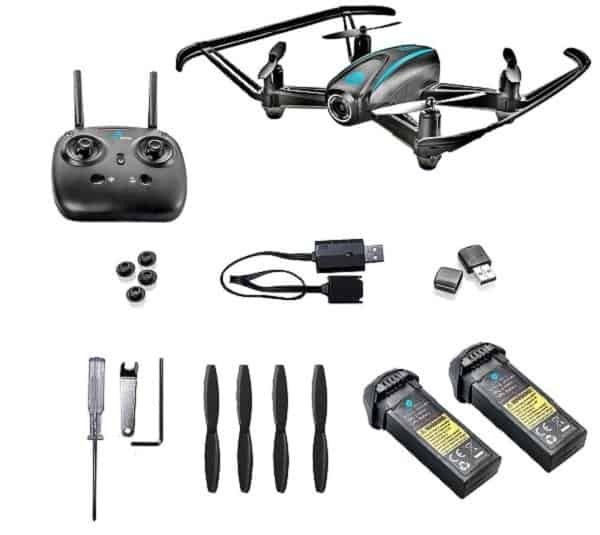 Note that the drone does not come with a memory card included. Easy fly modes for beginners. Three skill levels to practice with.